A stylish boutique hotel designed for guests' comfort and convenience, combining the finest facilities with personalized warm Thai hospitality. 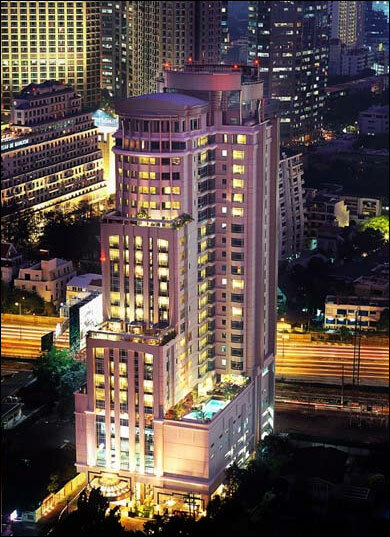 Located in Bangkok's Central Business District close to major embassies, banks and the Queen Sirikit National Convention Center. It is within walking distance of Phloenchit Skytrain Station (BTS), which is linked to the MRT underground station, providing fast, convenient transportation to key districts throughout the city. The International and Domestic Airport is approximately 30 minutes away by road. 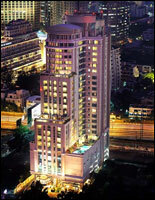 Feel truly welcome in this stylish boutique hotel, with 251 rooms, located in the heart of Bangkok. The Majestic Grande combines contemporary decor and state-of-the-art technology with a warmth of hospitality which is uniquely Thai. For friendly service and the best of comfort and facilities, whether travelling for business or pleasure, the Majestic Grande is your ideal choice. Relax in the luxurious comfort of our 251 guest rooms and suites, which combines, the convenience of high technology with traditional services and hospitality. The contemporary Thai-inspired decor is both elegant and refined, with lavish use of rich tropical hardwood, multi-colored marbles and granite. Furnishings are specially designed for absolute comfort, using the highest quality of fabrics and finishes, and the attention to every detail is absolute. Guests will appreciate, the moment they enter any room in The Majestic Grande, the impressive quality of all decoration and furnishings. Floors are of rich tropical hardwood and polished granite, with the warm glow of golden teak on every side. Panoramic windows present uninterrupted views over the city, while the thoughtfully conceived amenities combine the latest technology with every comfort, including a practical writing desk and an in-room safe that is large enough to hold your laptop computer as well as valuables. Guests have the choice of kingsize double or twin beds, with a 29" TV for entertainment. Bathrooms are lavishly appointed and beautifully equipped. With rather more space, these rooms offer an additional lounge extension, looking out over a small balcony garden of tropical plants with sculpture feature. Decoration is contemporary, but with touches of traditional Thai elegance. A 29" TV is standard and, as with all rooms throughout the hotel, there is high-speed wireless Internet access. Yet more space provides these rooms with additional lounge and working areas, while 34" TVs present a wide choice of entertainment and business information channels. Bathrooms are generous, with large bath tub and shower. More spacious closets make these rooms ideal for a longer stay. Located on the 20th floor, with sweeping city views, these larger than average suites have generous sleeping and sitting/work areas, with every facility and convenience (including high-speed wireless Internet access) for the business traveller seeking greater comfort and additional space in which to work and rest. Special features include private tropical gardens with outdoor seating terraces, while entertainment systems include 34" TVs. Bathrooms are also lavishly appointed, with bath tub, separate shower cubicle and adjacent dressing area. These eight suites, located on the 25th floor, form a unique and original feature of The Majestic Grande Hotel, as each has a distinctly different character and atmosphere, with specially designed decoration, furnishings and finishing touches representing its particular cultural theme. decor is contemporary, carried out with sophistication, taste and sometimes an element of humour, while each creates its own sense of romance and cultural inspiration. They all offer spectacular views out over the city, separate bed and living rooms with spacious working and sitting areas and high-speed wireless Internet access. Bathrooms are superbly appointed, with the additional luxury of private Jacuzzis. Entertainment systems include LCD flat screen TVs in both living and bed room. - Versailles : A classical French decor, with contemporary touches, to reflect the elegant style of fashionable Paris. - Emperor : Recalling the atmosphere of the Imperial Kingdom with its unique cultural heritage. - Maharajah : The romance and magic of Mogul India is captured in this opulent, yet modern interpretation of an exotic theme. - Pharaoh : The richness and magnificence of ancient Egypt was the inspiration for this stylish suite. - Beverly Hills : You might be in Hollywood, with this vibrant interpretation of the show business city and glamorous world. - Venicia : The elegance and unique character of the Grand Canal is recaptured in this inspired modern interpretation. - Mayfair : Why travel to England, when you can have the club-like atmosphere of a traditional British country house hotel right here in Bangkok. - Vimarnsawan : The hotel would not be complete without this tribute to Thailand's traditional culture, recaptured so elegantly in this luxurious environment. Here is space and luxury beyond imagining ! Two bedrooms (with kingsize and twin beds), each with its own en-suite bathroom and private Jacuzzi; an inter-connecting living room; separate dining and work/study areas - all facing out over a private landscaped garden terrace with a fountain feature and its own open-air Jacuzzi and golf putting green. There is a full scale home entertainment system, with 42" plasma screen TV. A guest toilet and private bar complete the facilities for this truly magnificent accommodation. - 29" TV in Grande Superior rooms and Grande Premier rooms; 34" TV in Grande Deluxe rooms and Grande Executive suites; LCD flat screen TV in Grande Wonder Suites and 42"Plasma TV in Majestic Grande Suite. - Extensive choice of TV channels, including satellite CNN, BBC, NHK, TV5, RAI, DW, ARY, DUBAI BUSINESS, CNBC, ALALAM, WORLD NET, FASHION TV, HBO, ESPN, STAR SPORTS, SUPER SPORTS, NATIONAL GEOGRAPHIC, etc. Rooms on the Executive Floor, offer a range of additional privileges and services to these important guests. Check-in is arranged in your room, local Bangkok telephone calls and an initial three hours of high-speed Internet access are complimentary. Refreshments and evening cocktails in the Executive Lounge is also available. Discounts are offered on laundry services and for room service, restaurants and business facilities. The club-like atmosphere of this spacious lounge, with its spectacular views over the city, is exclusively reserved for Executive Floor guests. It offers complimentary all-day refreshments and evening cocktails; a selection of international newspapers, magazines and useful reference library; large-screen TV tuned to satellite business channels and wireless Internet access. This is an ideal place for visiting executives to prepare for a busy day's schedule, or to relax and unwind after the challenges of developing business opportunities. With a choice of restaurants, offering the most delicious Thai, Asian and international cuisine, dining at The Majestic Grande is designed to be relaxed and informal, with food and beverage outlets to suit your taste and mood at any time of day. For evening entertainment there is live jazz, or atmospheric piano music by which to unwind, to chat with friends, or discuss a business deal. This trend-setting speciality restaurant on the ground floor, with its contemporary Mediterranean theme and decor, is a popular place for locals and visitors alike. The menu is authentic Italian, with elements of cuisine from other Latin countries. Enjoy an aperitif in the comfortable bar lounge area, then choose between the spacious main dining hall, its ceiling rising over two storeys above you, or the outdoor garden terrace, part of which is set on a glass floor with water and swimming fish below! This is the perfect venue for a leisurely lunch while, in the evening, a delicious dinner will be enhanced by cool jazz presented till the early hours by top-class groups. The sophisticated atmosphere is matched by the most attentive personal service. One of the most impressive features of The Majestic Grande is the unique environment to be discovered in and around our delightful out-door swimming pool. The sculpted pool, with its manicured city-style garden, sun terrace, fountains, statuary and lavishly decorated pavilion, will delight you. Equipped with waterfall showers, soothing Jacuzzi beds and a refreshing whirlpool bath, this is the ideal location for relaxation. The pool is overlooked by the outside terrace of our Dine@7 Coffee Shop, with drinks and snacks provided for your pleasure by attentive staff. Our lavishly equipped gym, overlooking the pool area, offers a wide selection of exercise machines and is designed for the serious keep-fit enthusiast, while adjacent sauna, steam room and large Jacuzzi will sooth away any over-indulgence. Thai-style massage therapies are provided and generously appointed locker rooms, with showers, provide every convenience to complete this contribution to your health and well-being. The Majestic Grande enjoys a convenient central location, close to The Queen Sirikit National Convention Centre, major embassies, banks, shopping and entertainment districts. There is easy access from Sukhumvit and Rama IV roads and onto the elevated highway (toll) network, with the international and domestic airport being approximately only 30 minutes away by taxi, or hotel limousine. Within walking distance is a station on the ultra-modern Bangkok Mass Transit System (BTS Skytrain ), which is linked to the Mass Rapid Transit (MRT Underground) system. Together these provide fast, traffic-beating transportation to key districts around the city for business, sightseeing, shopping and entertainment. - Shopping centres and leading department stores, including Central Chidlom, The Emporium, Robinson, Gaysorn Plaza, Central World Plaza, MBK, Erawan and upcoming Siam Paragon.